Personalized printed text for this item is an additional cost ($10 setup fee, $2.00 each for printing). Add to cart and select "blank" if you plan to fill in the text yourself or "print" if you want us to add the lettering. 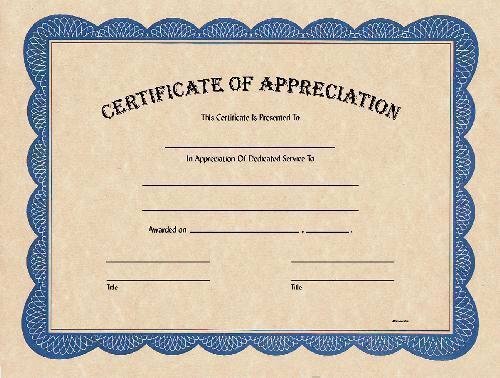 Certificate of Appreciation measures 8.5x11", on parchment-colored paper with blue border. Includes spaces for noting individual's name, the action of appreciation, date awarded, and names/titles of presenter. Place in cart to order online and specify printed text if desired.